Another book review. No castle content in this one. Okay, this one is a year old, but I just got it from the library and figured I'd add to my series of reviews. Oliver Albrecht (aka *Olly*) and Joe Klang(aka -derjoe-) built The Big Unofficial LEGO Builder's Book, subtitled 'Build your own city'. As the name implies, this is all about building in the city theme. Really, though, it is mostly about vehicles, so a more accurate subtitle would have been something like 'Driving around the city'. The book opens with a few pages of text, providing some definitions and acronyms that AFOLs use, urls to a few important community websites (of course it's always problematic which ones to choose), and a short tutorial on SNOT building. One thing really bothered me. On page 14 when they are discussing making balls, they write "A variety of solutions circulate in the LEGO forums around the world; here is ours:", and then they give exactly the instructions for the Lowell sphere. I'm not saying that there is ownership of LEGO building techniques, and you need to give credit when you build anything, since almost every technique has been done before. But don't specifically say "Here is my design", and then give someone else's design. That quibble aside, the book quickly moves into it's main focus, directions to build city-themed MOCs, mostly cars and trucks. The first half of the book is devoted to microscale. There are 22 cars and trucks, all built at 2-wide, with 5-plate-high people. I like that they do wheels a few different ways, which lends some variety to your microscale world. They also show how you can take the same basic car design, and by varying up the colors and switching out a few parts you can get a lot of different vehicles. They also include directions for a couple of buildings, a tree, a helicopter and a plane. The designs are all well done. They are fairly simple, since micro cars are necessarily only a small number of parts, probably appropriate for intermediate builders. The instructions are very clear in LDRAW and in full color, and include parts lists. Interspersed with the directions, they have photographs of a large microscale city layout, incorporating all of the different designs in the book. The layout is great, and I would have loved to see even more of this. In the last ~40% of the book they focus on minifig scale. A cab, a Ferrari, a convertable, a truck, and a helicopter are all built at a six-wide scale. Again, the instructions are done in LDRAW, full color, with parts lists. These models are more for intermediate to advanced builders, and the results are really good (especially the truck). There are a few photos of the completed models, but mostly just the vehicles on simple bases (there is one with a house) rather than set into a larger layout. While I liked the minifig scale vehicles, I really thought these should have been in a separate book, and left this book just at microscale. I thought this book turned out really well. 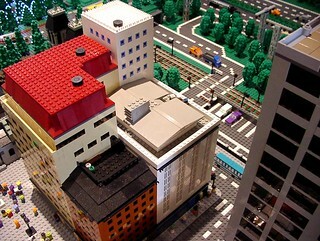 The models were great, and now I want to go build more micro city MOCs. I note that the same builders have been busy, with the previously noted Joe's Garage: Build your own LEGO Vehicles by Klang, and Build your own Galaxy along with Lutz Uhlmann and Tim Bischoff. City isn't quite my theme, but I've been looking to get into micro-scale, so this might give me some ideas besides castle and space micros.